Many years ago I use to spend three/four nights a week during the month of May for eels and was fortunate to catch plenty of fives, sixes and a seven. Nowadays if I get three nights a year for one of my favorite species I'm lucky and if one graces my net then its a result so guess how I feel after my second session this spring produced this monster? I really do need to make more time! Eel fishing can be slow at times, especially when targeting a big lake with just a few monsters lurking around. Just the anticipation of what the night will bring and slowly drifting away to a sunset like this is enough. An hour of patient feeding to get the carp competing in the crystal clear water was needed before a single rod with a zig was positioned and half a dozen of these came along. Not the biggest but watching them take zigs in such clear water does help fine tune things as its amazing just how many times I got done before one slipped up. It wont be long before my favourite big carp venue opens, so expect a few big fish to follow soon! This is what you are missing out on! This is what your missing! Image 4 - Fish of a lifetime! If your thinking about it then I think I can squeeze a couple more dates in between Aug 6th - 17th. Want to learn all the tricks? Frensham - First come first served. Although I have a number of anglers requesting days at Frensham, getting a deposit so that I can confirm dates seems to be a problem so I have now made the decision that no dates will be held until payment received, so if you have been thinking about sampling the fantastic fishing this venue has to offer and learning over three decades of angling knowledge then email me now as I only have two days left. Really looking forward to getting out for a spot of eel fishing tomorrow night with my good mate Chris Petter who took this amazing eel haul, with fish to 4lb 5oz a few years back. Fingers crossed! Flash back quite a few years to Frimley Pit 2. Back then, when it was controlled by Cemex Angling I almost had the lake to myself and remember the brilliant fishing it delivered including this breeze block of a tench weighing 10lb 4oz that was taken on the float and size 18 hook! Frensham – Three spaces gone, five to go! Three days guiding at Frensham have already been snapped up and with a number of other enquiries pending they maybe all gone come the weekend! 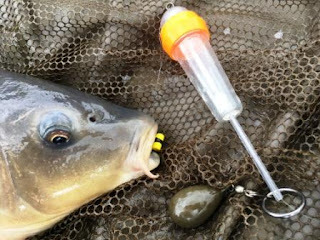 Thought I’d wet your appetite to what’s on offer at Frensham, just look at the images – action, specimen rudd and tench and the chance of a red-letter day just like Mathew had. Price for a one-to-one guided session £135. I will point out that if you want to catch rudd then it will have to be either a session fishing into darkness or even an all night session which gives you the added bonus of lading a few tench in the morning. Tench sessions are from dawn onwards. If you’re a FAS member and want to bring a guest no problem, I will simply work out a price that will make it better value per angler. If you have any questions or just want to find out more details then simply email me at – duncancharman@me.com. It's not all about the fish! The reason we go fishing? Unfortunately with Dad's funeral this coming Friday fishing will have to take a backseat till next week, as it has done for the last couple. In the meantime I'm thinking of the reason we all go fishing, waking up in the morning to sights like this and if a fish or two come's along then lets face it, its a bonus. Inside this weeks Anglers Mail. 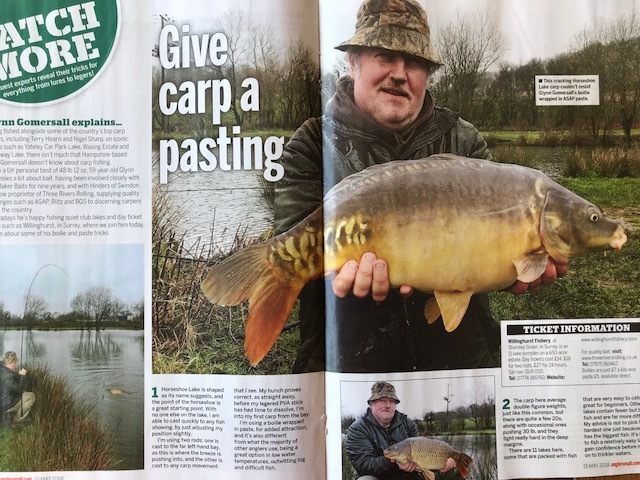 Get your copy which is out today for loads of great tips and advice including my 'Where to Fish' column for the South East and a great article shot by myself with Glynn Gomershall of Three Rivers Rolling at Willinghurst Fishery in Surrey on how to catch carp on paste. There’s no better way of catching tench than on the float and I know a venue where sport can be hectic even on a sunny day. The ‘mag & wag’ has seen a decline in its use in recent years, probably due to the introduction of the heli-rig, flat –bed feeder and pellet cone but watching a float slid away to me is one of anglings finest moments. Im always here if you want to master the art of fishing the waggler! Think it’s easy, well think again. 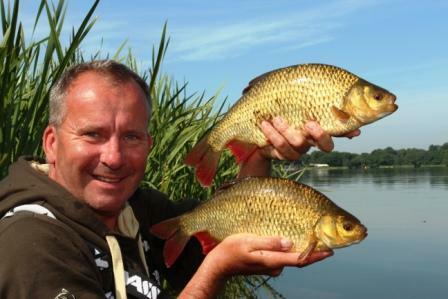 Arguably the best lake in the country for catching big rudd and numbers of quality tench and its available to you! Over the next few weeks I will be bringing you details of my guiding/tutorial days at Frensham Great Pond in Surrey. In brief I have just eight days available as from the 16th June and expect these to go very quickly. The perfect venue to learn new methods. Recently it’s all been about heading to relatively easy venues and getting a few bites. 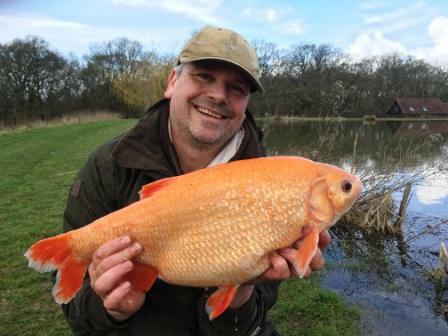 Harris Lake controlled by Godalming Angling is not just for members but also for anglers wanting to fish a well stocked lake on a day ticket. What I love about this venue is that it contains no carp so tactics can be scaled down in order to catch the stunning crucians and tench within. My last session lasted just three hours and was all about getting some action and catch images for a European magazine article and fish after fish graced my net. Another great thing on Harris is that it’s a great water to learn and perfect tactics like the pellet cone, flat-bed feeder and helicopter rig as well as float fishing in the margins. If you fancy learning a few new methods then heading to your local water or even returning to Harris to enjoy its fantastic sport then I’m offering tutorial days which include bait, tickets, terminal tackle, even the use of my tackle if needed. Interested? Well just email me at duncancharman@me.com for further details. tweaks whilst the weather is bad. 02/04/18 – It’s been forecasted all week, heavy rain and don’t go out however was the weather that bad today know, why oh why do we listen? In all honesty I had already planned to stay in as I wanted to get the carp rods made up and all my tackle boxes organised for specific species which is exactly what I did. 03/04/18 – Another wet day but with the weather improving as the day progressed I finished off getting organised and headed to Johnsons Lake hoping the crowds would have disappeared and the lake would be quiet, wrong! The car ppark was rammed as was the railway bank with around ten anglers all looking as if they were set up for the night. Undeterred but slightly on the back foot I headed to quieter waters and soon had a 5lb tench in the net. 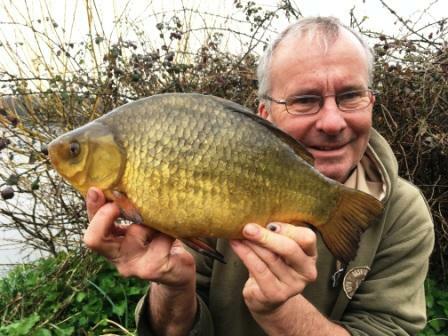 The same rod was away half an hour later which turned out to be a fish of a lifetime, a crucian weighing exactly 4lb. This close in rod then went quiet but the distance maggot feeder started to produce, three tench in fact all around 5lb. As darkness fell the action tailed off so at 9.30pm I called it a day. Rumours are the crucians are hard to come by and the fishing tough so to take five fish in less than five hours to say I was buzzing is an understatement. 04/04/18 – Up early and at Johnsons come 6am but how two days can differ as today its not far of a frost, the atmospherics have gone from 994mb to 1018mb overnight and the clouds have dispersed leaving a cloudless sky , oh and the wind has swung and is now coming from the N/W. It was always going to be tough but at least I got a bite from a tench that is more than most! Back at home come midday and quickly organised the zig tackle for a few hours tomorrow. Not allot happening at Johnsons but one angler did have four crucians the day before, best 3lb 15oz but most struggling for bites and then when they come are mostly from tench. 06/04/18 – Headed to Johnsons early this morning really to make sure my zigging tackle is all organised as I have a friend who wants to get to grips with this method next week. Found plenty of carp in front of peg 7 but a few small problems with rigs tangling meant come midday no bites had come and I needed to rethink certain approaches. Luckily an angler called Karl was also zigging and gave me some really useful tips to avoid these tangles. Cheers mate! 08/04/18 – Knowing that Johnsons would be rammed first thing, decided to delay my arrival until midday when most would have hopefully avoided the rain and headed home. My tactic worked as just seven other anglers were around so had the choice of swims. Heading to the railway bank I dropped into muddy peg 18 with Chris in 17 and although hopeful I did fear that there would be allot of bait still un-eaten in front of us. Fishing the cone on one and heli-rig on the other I was away after about an hour from a tench but things looked grim as the lake was still, no fish showing and the rain relentless! I managed one more bite come 8pm which came from a 3lb 1oz crucian and Chris managed just one tench. 10/04/18 – Today was all about one of my regulars, Neal Webb learning the art of zig fishing, even if catching a carp was a little remote due to the chilly north wind and knowing that most of the fish were out in the middle of the lake, well out of reach of our casting capabilities. Fortunately the rain that was forecasted never arrived and we were able to go through the whole procedure including rigs, baiting, clipping up, lead dropping etc. Although he had booked a whole day I had decided that it best, due to the conditions, that this was split into two half days, today about learning and then the second about catching. In between time he could head out with the knowledge learnt to a heavily stocked venue and catch a few before returning to my venue where he would stand of catching a number of twenties. As expected the carp were showing at distance but one of the rods did rip off, however the culprit was a decent sized tench! 11/04/18 – I was hoping for one last chance at a big crucian at Johnsons but on arrival at midday the lake was rammed so having my father with me decided to head to Harris Lake. Knowing that it’s been a slow start at Johnsons I was half expecting the same on Harris but ten minutes in and the first of more than a dozen tench graced my net. It was a strange session as even after trying to get Dads rods going I couldn’t and I must have had ten fish before his first bite, however my swim died and his came alive and come 7pm he had caught me up and we called it a draw at around thirteen fish each which included the odd crucian around 3lb! 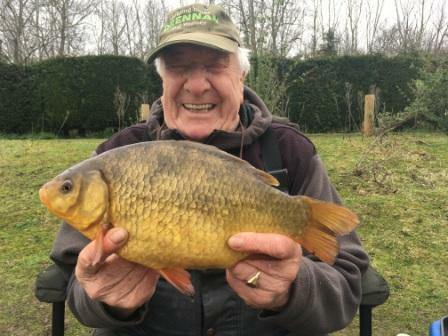 13/04/18 – On the banks of Johnsons for one last try for another big crucian. Barrie and Mark were already there when I arrived at 6.30am and amazed at how quiet it was which allowed us all to set up in a row along the Railway Bank. Conditions once again not great, basically as there was very little wind. 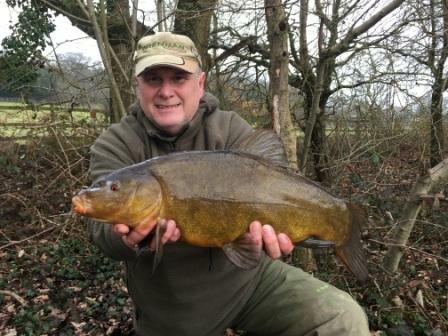 I was off the mark first with a tench which came three hours in followed by another big crucian, once again weighing exactly 4lb. Another tench came later in the day but come 5pm it was clear things wernt going to liven up. Mark and Barrie stayed on but Barrie couldn’t buy a bite even after moving a number of times and Mark managed five tench and a 3lb 2oz crucian. 16/04/18 – A day in the office getting my Anglers Mail WTF column sorted. 19/04/18 – Early start, up at 4.30am as heading to Brighton Marina to fish for plaice. Arrived at my brothers at 5.30am and headed down with good friend Chris. Arriving at just after 7am we parked (free if using the marina facilities) in the marina car park then walked to the East arm picking some black lugworm up on route. Hottest day of the year and slightly further walk that would have liked but finally dropped into slot 33 on the bend of the arm. Thirty minutes in and the first bite came to my rods which produced the first plaice of the day, all ten inches of it! Bites continued to 1pm (high tide) which resulted in a variety of species, small plaice, dab, rockling, black bream and whitting to name a few but all were very small. There were a few other species caught, spurdog, dogfish, Pollock and bass but again all small and come 3.30pm with the sun beating down, anglers casting everywhere we decided to head home and beat most of the traffic. The session wasn’t all about catching, although a few 2lb plus plaice would have been nice, but more of a catching up with Chris as its been over 5 years since we all last fished together. It won’t be five years again as we are planning a mackerel session on Hayling this summer. 20/04/18 – A days videoing at Marsh Farm with Paul Garner had to be cancelled late Thursday night due to car problems which put me at a loose end but managed to spend a couple of hours with Dad and Mick (girlfriends dad) at Badshot Lea who were catching bream even in the hot weather, before sorting the zig kit out for a few hours at a local day ticket venue on Sunday. 22/04/18 – Should of known the day ticket venue was mega busy so turned around and spent the day in the office compiling my WTF column. 23/04/18 – Arrived at my local day ticket venue at around 1pm. Only one other angler on Horseshoe so dropped in here cast out zigs and proceeded to catch around a dozen carp to 18lb by 6pm! 24/04/18 – The weather has certainly changes with temperatures dropping especially at night. Headed to Badshot Lea in the hope of getting a few carp feeding on the surface but the cool wind made things difficult and although the odd carp did surface, they weren’t in a feeding mood so no need flogging it out in wrong conditions. 26/04/18 – Forgive me for the lack of news but today I lost my father, RIP my friend. 29/04/18 – It’s what Dad would have wanted, me to continue my passion through the hardest times so this morning I headed back to Harris where we last fished together, mainly to keep myself active and to get some images I needed to get a European article completed. Fished with my mate Chris who helped with images and another good friend, also Chris so it was good to talk and share a few things. The weather wasn’t great, horrid cold northerly and just six degrees but we had a few fish, seven tench and a three crucians in just three hours. 30/04/18 – Spent the day completing the article, plus getting on with my WTF column as time is going to get eaten up over the next couple of weeks doing family things.